1) Select References > Insert Citation > Add New Source. 2) Choose a Type of Source and then fill out any other information on the source. 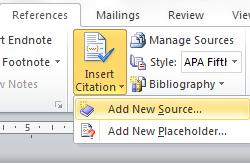 If you need to add more information about a source, click the ‘Show All Bibliography Fields’ check box. 3) Give the citation a tag name in the tag name box. 4) Once you are happy, click OK. You can now drag your citation anywhere on the actual document. Most prefer the footer. 5) Select References > Bibliography and your citation will be formatted for you. If you do not yet have all your citations at hand, you can create a place holder citation by selecting References > Insert Citation > Add New Placeholder. This is by far the easiest way to manage citations in your documents. For more MS Office tips and tricks, watch this space.